The present volume and its companion volume Crucial Choices—Crucial Changes: The Resurrection of Psychotherapy are part of the series In Search of the Future. They are the result of a collaborative effort by the American Mental Health Foundation Inc, New York, the International Institute for Mental Health Research, Zürich and Geneva; and the French-American Institute for Mental Health, Paris. The publications jointly prepared by these three organizations allow for vastly divergent views of their editors and authors, all of whom are chosen from the best in our field. The underlying purpose of both volumes is to offer the reader an incisive view of how to approach the future by considering our present fundaments, by eliminating approaches and policies that have proved detrimental and, most of all, by offering constructive avenues and solutions leading to major improvements. Beyond this, the two volumes are radically different from each other. The present work looks at the views and proposals of many of the foremost authorities in our field, both in the United States and in Europe. The companion volume, however, is largely based on almost 50 years of intensive studies conducted by the American Mental Health Foundation, critically examining the activities and status of the mental health professions in order to safeguard the interests of the emotionally ill and those of the dedicated psychotherapy student and practitioner. The work offers detailed examination of many undesirable approaches that must be discontinued, as well as carefully worked out solutions leading to needed improvements in our field. More about this later. As stated, the volume at hand offers cogent studies by foremost mental health professionals. They represent a variety of different perspectives, covering the major areas of psychotherapy, in an attempt to establish the more important issues as well as the most promising opportunities for the future. In the first section well-known psychotherapists and mental health professionals present their views of what future developments may be expected in the practice of psychotherapy generally and, in particular, in their respective countries. They also take into consideration socio-economic and political influences. For the second section the Foundation requested a carefully selected number of leading psychoanalysts and psychotherapists, representing a diversity of approaches, to write on the particular subject within their expertise which they consider to be of major importance for the future of psychotherapy, and to present their suggestions and solutions. The third section addresses the problems besetting outcome research and the quest for quality in psychotherapy. The fourth section provides a variety of treatment approaches that hold promise for the future. Foremost among them is the intensive psychodynamic group therapy method developed by the Foundation, offering effective, affordable treatment to a majority of patients. In the last section American and European mental health experts address considerations of public interest regarding future mental health care. Attention is also given to the effect on psychotherapeutic practice and mental health resulting from changes in governmental health policy in the United States. Crucial Choices—Crucial Changes: The Resurrection of Psychotherapy is one of the most challenging works to appear in decades. It is of paramount importance to the future of psychotherapy. This work examines basic problems of psychoanalysis, psychotherapy and mental health with three major considerations foremost: the extent to which the welfare of the patient is considered, the examination of present-day quality of professional work, and the steps which are necessary to bring about decisive improvements in psychotherapeutic effectiveness and teaching. In the first part of the book, experts such as John E. Gedo and Robert J. Stoller discuss the problems of marked deterioration in training, the practice of psychotherapy by professionals lacking necessary expertise and the widespread use of unclear language in psychoanalytic and psychotherapeutic writings and teaching. The major part of the volume, written by Dr. Stefan de Schill, the director of research of the American Mental Health Foundation, is devoted to an extensive critical examination of contemporary psychotherapy in the light of clinical experience. This is done with the aim of bringing about major improvements in therapeutic proficiency by offering concrete solutions leading to such a goal. a frequent rationalization of such inadequate practices, writings and teaching by means of easy generalized theorizing, couched in scholarly terminology but devoid of the necessary clinical basis. Of necessity, these practices cause much harm to those under professional care and to students seeking to acquire valid knowledge. The study goes far beyond mere criticism. In each instance, shortcomings are contrasted with the facts of clinical experience. As a consequence, a wealth of valuable clinical material, not found elsewhere, is presented here. The purpose of this work is essentially constructive. The detailed solutions proposed have a twofold goal: to eliminate widespread deficiencies as well as to bring about marked improvement in psychotherapeutic practice and teaching. The work describes promising approaches for mental health treatment and policy, the result of 45 years of work by the American Mental Health Foundation. The proposed solutions are feasible and substantive. We consider Dr Stefan de Schill’s careful and extensive examination of the shortcomings of present-day psychotherapy, its practice and teaching, as well as the solutions suggested by him, to be of utmost value. His articles in the volume demonstrate outstanding clinical experience and expertise, a rarity among contemporary writings all too frequently characterized by abstract theoretical speculation of little psychotherapeutic utility. What a welcome breath of fresh air Dr. de Schill’s book is. 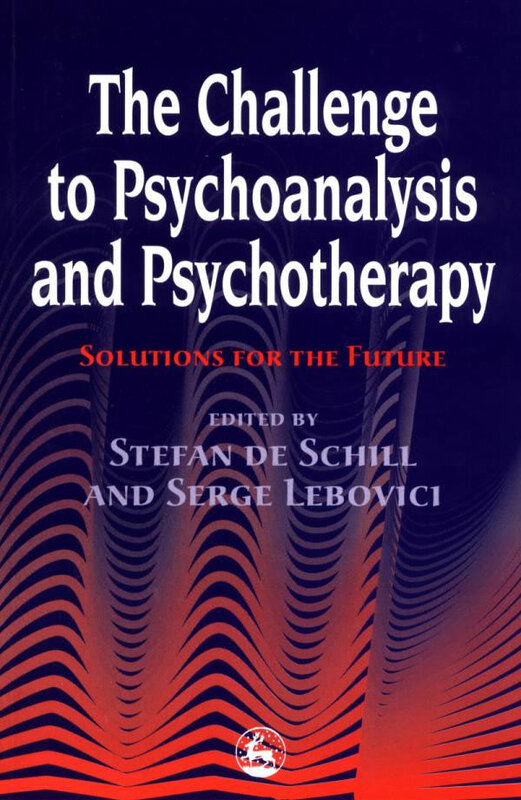 Dr. de Schill’s main chapter stands as a much needed expert correction to the mountain of highly speculative and unanchored theory-building in the field of psychoanalysis and psychotherapy. On the basis of numerous cogent examples, he demonstrates the need for an expert clinical approach as the indispensable tool for understanding the unique psychological make-up of the individual. This stands in marked contrast to the facile practice of generalizing broad ‘theory’ to every patient, regardless of his/her individuality in structure and dynamics. I do not know of any analyst more capable of understanding and formulating very complex concepts in a clear and cogent manner. I believe the book will have a major impact where improvement is most needed: 1) in patient care, and 2) in the training of psychotherapists. We considered the manuscript of the volume Crucial Choices—Crucial Changes: The Resurrection Of Psychotherapy to be a most fascinating, insightful and challenging work. To these opinions I would like to add my own evaluation, which is shared by a number of experienced clinicians participating in the work of the Foundation: Dr. de Schill’s findings, by addressing the fundamental problems and offering viable answers of importance, provide our profession with a realistic way out of the present predicament. Moreover, he presents unique and invaluable clinical observation, allowing the practitioner to arrive at a more profound understanding of the psychological make-up and functioning of the individual and guiding him toward improved treatment efficacy. These achievements are of crucial significance for the future of mental health.